1 Esdras is a book from the Septuagint Greek translation of Hebrew scriptures. Largely a recapitulation of other biblical texts, it is regarded as canonical in Eastern and Oriental Orthodoxy, but is considered as apocryphal by Jews, Catholics, and most Protestants. It is also listed among the Apocrypha in Article VI of the Thirty-Nine Articles of the Church of England. "Esdras" is simply the Greek word for "Ezra," and it is from the Book of Ezra that 1 Esdras borrows most heavily, together with the books of Chronicles and Nehemiah. It also adds new material not found in the canonical texts, notably concerning the legendary background of the Jewish leader Zerubbabel while he was still living in Babylon. Specifically, it relates a tale of how Zerubbabel defeated two other young noblemen in an intellectual contest in the court of King Darius and thus won the king's permission to lead a new wave of Jewish exiles back to Jerusalem. The new material accounts for 99 verses in 1 Esdras, including a more polished conclusion than that of the much shorter Book of Ezra lacks. In the Slavonic editions of the Bible this book is called "2 Esdras;" in the Vulgate it is called "3 Esdras," and in the Ethiopian Orthodox Bible it is called Ezra Kali which means "2 Ezra." Although only partly original, 1 Esdras represents a summary view of the establishment of Second Temple Judaism as a providential renewal of God's covenant with the Jews. Also, its new information on Zerubbabel shows that he was an important figure to many Second Temple Jews. Compiled by a Jewish writer in Egypt probably about 150 B.C.E., 1 Esdras is primarily a translation into Greek of older Hebrew texts, adding some new material and occasionally updating the older text. It was included in the collection of Jewish scriptures known as the Septuagint, which was created in Alexandria, Egypt, and circulated widely among the Jews of the diaspora. However, after the destruction of the Temple of Jerusalem in 70 C.E., rabbinical authorities rejected the Septuagint. Thus, 1 Esdras and the other works of the Apocrypha came to be excluded from the Jewish canon of scripture. However, since educated Christians generally knew Greek and used the Septuagint, it did become a basis for determining what books belonged in the Christian version of the "Old Testament." 1 Esdras presents various problems of naming. In most editions of the Septuagint, its Greek title is Εσδρας Α′ (1 Esdras), and it is placed before the traditional books of Ezra and Nehemiah, which are together titled in Εσδρας Β′ (2 Esdras). However, the Latin Vulgate version of the Bible titled the books of Ezra and Nehemiah as "1 and 2 Esdras," giving the current book the title "3 Esdras." Since most modern translations use the more Hebraic transliteration of "Ezra" for the canonical Book of Ezra, the Vulgate's "3 Esdras" is now called 1 Esdras in most English Bibles. The Vulgate's 4 Esdras, meanwhile, has become 2 Esdras. The majority of the content of 1 Esdras closely parallels the books of Ezra, Nehemiah, and 2 Chronicles. However, it changes the order of some sections, updates the text to suit the writer's theological views, and adds some significant new material as well, particularly in chapters 3-5. The book's contents are summarized as follows. Chapter 1 ( = 2 Chron 35:1-36:21). Josiah's institution of the celebration of Passover and his tragic death, followed by the history of Jerusalem up to its destruction and the Babylonian exile of the Jews. One significant change from the version of Chronicles is that 1 Esdras states that it was the prophet Jeremiah, rather than Pharaoh Necho II, whom God inspired to warn Josiah not to attack Egyptian forces then en route to Babylon. Josiah's death is thus attributed to his disobeying a command from God through a known prophet, rather than a warning from God given through the Egyptian king. Chapter 2:1-14 ( = Ezra 1:1-11). The edict of Cyrus authorizing the Jews of Babylon to return to Jerusalem. Chapter 2:15-26 ( = Ezra 4:7-24). The first attempt of the returning Jews to rebuild the Temple is blocked by Samaritan opposition. Chapter 3:1-5:3 (original). The story of Zerubbabel as the Jewish deliverer. Three courtiers of King Darius dispute the question of what is the strongest thing in the kingdom. The winner of the debate is to receive great honor and favors from Darius. One of the courtiers is Zerubbabel, a descendant of the Jewish King David. The three young men publicly debate the matter before the king and his court. The first holds that wine is the strongest, the second claims that the king is the strongest, and Zerubbabel declares that it is women who are strongest, but that Truth is even stronger than women. Darius concurs with Zerubbabel and, at his request, appoints him to lead a new wave of Jewish exiles from Babylon to Jerusalem to complete the restoration of the Temple. Chapter 5:4-6 (original). Beginning of a list of the exiles who returned. Chapter 5:7-73 ( = Ezra 2:1-4:5). And extensive list of exiles returning with Zerubbabel. Beginning of the Temple's reconstruction and Zerubbabel's rejection of Samaritan assistance, followed by their opposition and another interruption of building. Chapter 6-7:9 ( = Ezra 5:1-6:18). Correspondence between the governor of Syria and Darius clarifying the latter's authorization to rebuild the Temple, followed by details of the completion of construction. Chapter 7:10-15 ( = Ezra 6:19-22). Dedication of the Temple under and the celebration of Passover. Chapter 8:1-9:36 ( = Ezra 7:1-10:44). Return of additional exiles under Ezra, acting as the agent of the new Persian king Artaxerxes. Ezra's preaching and legislation against mixed marriages requiring that Jewish men divorce their Gentile wives and send them away, together with the children of these unions. Chapter 9:37-55 ( = Nehemiah 7:73-8:12). Ezra reads the Law, reaffirming God's covenant with the Jews. The primary purpose of the book seems to be the presentation of the story of Zerubbabel, who is depicted as a kind of Daniel-type figure in the dispute among the courtiers. Zerubbabel, a descendant of the Davidic dynasty, was a figure of great hope during the time of the early Second Temple, and he plays a semi-messianic role in the Book of Zechariah. 1 Esdras begins with King Josiah—the Bible's greatest king since David—and places new emphasis on Zerubbabel's role. 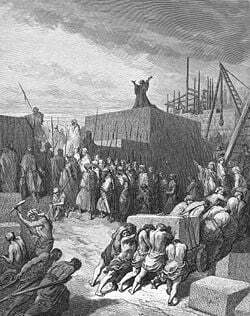 Ezra's work comes clearly on Zerubbabel's foundation, and as the agent of a new Persian king, Artaxeres. He renews the Jewish commitment to the Law of Moses centering on the Temple of Jerusalem and the principle of Jewish ethnic purity. The work may thus be said to constitute a summary of the author's historical vision of the establishment of Second Temple Judaism as the providential renewal of God's covenant with the Jews. The first century C.E. Jewish historian Josephus made use of the 1 Esdras in his accounts of Jewish history. Some scholars believe that the composition is likely to have taken place in the first century B.C.E. or even as late as the first century C.E. However, the majority place it earlier, around 150 B.C.E. Many Protestant and Catholic scholars assign no historical value to the "original" sections of the book, which are thought to resemble the legendary accounts of the Book of Daniel. However, of considerable value to textual scholars are 1 Esdras' citations of the other books of the Bible, which provide a unique, pre-Septuagint translation of those texts. Moreover, 1 Esdras gives important insights into the character of Second Temple Judaism, as well as into the importance of the figure of Zerubbabel which would otherwise be harder to discern. Since there are various discrepancies in the account, many scholars hold that the work was written by more than one author. In the current Greek texts, the book breaks off in the middle of a sentence, and that particular verse thus had to be reconstructed from an early Latin translation. It is generally presumed that the original work extended to the Feast of Tabernacles, as described in Nehemiah 8:13-18. An additional difficulty with the text is the apparent ignorance of its author regarding the historical sequence of events. Artaxerxes is mentioned before Darius, who is mentioned before Cyrus. Finally, the person called "Attharias" and "Attharates" in the text (5:40; 9:49) is apparently a Greek transliteration of of a word meaning "governor," which is used for Nehemiah in the Book of Nehemiah (8:9; 10:1). The name Nehemiah does not appear in 1 Esdras. The book of 1 Esdras was widely quoted by early Christian authors, as well as Josephus. It also found a place in Origen's Hexapla, which placed various versions of the Old Testament side by side. However, it was not included in early canons of the Western Church. In the late sixteenth century, Pope Clement VIII relegated the work to an appendix following the New Testament in the Vulgate "lest [it] perish entirely." However, the use of the book continued in the Eastern Church, and it remains a part of the Eastern Orthodox canon. Coggins, R. J., and Michael A. Knibb. The First and Second Books of Esdras. The Cambridge Bible commentary, New English Bible. Cambridge: Cambridge University Press, 1979. ISBN 978-0521097574. Myers, Jacob Martin. I and II Esdras. Garden City, NY: Doubleday, 1974. ISBN 978-0385004268. Talshir, Zipora. I Esdras: From Origin to Translation. Atlanta, GA: Society of Biblical Literature, 1999. ISBN 978-0884140061. Taylor, Leslie John. Extra-Biblicals: Forgotten Books of the Bibles. [S.l. ]: 1st Books, 2003. ISBN 978-1410735676. This page was last modified on 9 January 2019, at 00:29.